It appears that Netflix does not display the customer ratings for movie suggestions anymore. I have decided to revive the review portion of this blog as a public service. I have begun and stopped so many movies in Netflix. They are either too gun happy, war-happy, murder-happy. I watch Netflix movies so that you do not have to. Please take a look of my review of First Match, a Netflix original movie . When I was a young woman, I knew the life I wanted but I had no idea how to get there. I understand what it is like to have to forge your own way through uncharted territory. When I meet someone, who has done just that, I choose to celebrate her. I am excited to share my conversation with Shirene Hicks. Shirene is a minister of the gospel, radio host, author, and police officer. I would describe her as a modern day super heroine with a bible in one hand and a gun in the other – carrying the law of the Lord and the land. She is a devoted wife and mother of three beautiful girls. Who says a woman cannot have it all? I am the founder of Breaking Through Barriers Ministries. I am an ordained minister. I am the author of the book, “365 days of Tears”. I have also been a law enforcement officer for the past 13 years. Currently, I host a weekly radio show every Monday on 1570 am from 4:30-5:00pm. The goal of my radio show is to inspire both hearts and minds. I am working towards a second Master’s degree at Loyola University in counseling. I enjoy spending quality time with my husband and three children. I am called to missions and the prophetic. I recently visited Haiti and I had a life changing experience. I have a love and desire to help those that are in need. I find comfort while on the mission field. It is my opportunity to humbly give back and minister to others. Over a decade ago I discovered my calling. Through dreams I saw myself traveling the world and digging wells. I knew then that I had an awesome mission ahead. One thing that I absolutely love to do is travel. I enjoy traveling both domestically and internationally. What is fear to you and how have you overcome fear? Fear is a stumbling block and it prevents progress. I had to overcome fear when being vocal about feminism. I am a feminist. I am interested in equality. My goal is not to bash men but to fight for equality among women. When I identify myself as a feminist, I am often judged especially by my male counterparts. I overcame fear by accepting who I was called to be. My greatest accomplishment is finishing my book, 365 Days of Tears, within a two-month time frame. During that time, I had an infant daughter that I also had to care for. Every morning after, when she was sound asleep, I would sit up and write from 2 am to 5 am. What is the goal of your ministry? How do you measure its success? The goal of my ministry is to preach the kingdom of God in a way that will draw all to Christ. I measure my ministry success by the change that is evident in others. In the near future, I am working on opening up my very own counseling center. I am currently working on a second book. I am also building a global women’s ministry. A ministry where women can come together and build one another up. A ministry that will allow room for travel, retreats, and other outings. Website: prophetessshirenehicks.com for upcoming speaking engagements and conferences. Breaking Through Barriers Ministries Prayer call begins on January 1, 2018 at 7 pm. Dial in # (563)999-2090 access #338929 playback# (563) 999-2099. The prayer call is every Monday. Is a mermaid on land. With feet in the sand. A new land out of the sea. I am not as obsessive with my scale nowadays. I get on it one every other day and not everyday :-).Seriously folks. For a few weeks, I had been gaining and losing the same 3 lbs. It was starting to get on my freaking nerves.I felt myself getting close the that cliff. That edge that tempts you to chalk it up to genes and eat the darn Doritos. We have all been there, right? Right? Ok, maybe just me. Then I remembered my post – It's All Mathematics. That extra slice of cheese, that helping of ice cream was all adding up. . .on my thighs. Back to the drawing board. I reviewed my diet and designed a workable plan. Back to my oatmeal in the morning. Plain yogurt and fruit for snack. Reasonable lunch 800 calories or less and a sensible dinner. I reviewed my workouts via my phone app and I had slacked to about 3 times per week. My goal is to be at 5 times per week. Seriously, I have been working out extra hard with a trainer. Why put myself through that torture – and believe me it is torture – to undo it with mindless snacking, being lazy or eating out? I get on the scale today. For the last few days, those 3 lbs have stayed gone. Shoot, I'm tryna be fine by my birthday. I am losing weight and would like to visually document the progress. I find before and after photos (untouched) of regular (non-famous) women so motivational. It is a real, physical reminder that what I am looking to accomplish is very doable. As aforementioned, I don't just want to lose weight. I also want to be fly. *ignore the the fact that I just used the word aforementioned in a sentence* lol. One thread to all of the fabulous looking after shots is the use of weight training to transform the body's appearance. 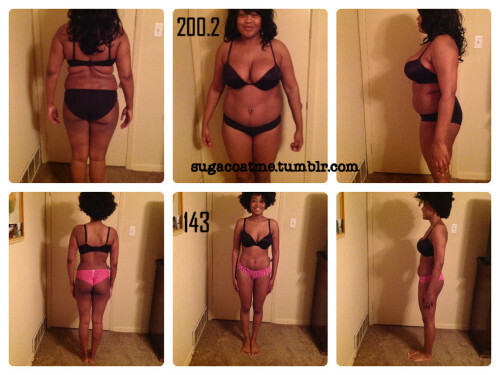 These are some of the motivating photos I have found via Black Women Do Workout.and a Black Girls Guide to Weight Loss. Growing up, it was a compliment to be a curvy woman. Coming of age, I quickly learned that to be a 'brick house' was the business. With this mentality, it easy to ignore your growing BMI (Body Mass Index) and health warnings. I have heard others state that those health charts did not apply to black women because we are naturally bigger girls. Comedian Monique had a stand-up centered around applauding the plus-sized sister. I have since learned that this is just not the truth. There comes a point in life when you have to face that fact that you are over weight, the fact that you cannot go up a flight of stairs without becoming out of breath. You have to look in the mirror and honestly say to yourself, "That ain't baby fat, that's fat, baby." Like truth, exercise hurts. Reread that sentence and let it settle in and then – GET OVER IT! Anytime you push yourself beyond your comfort zone, it hurts. By hurt, I mean muscle discomfort. If you have joint issues or back issues, see your doctor. Whenever you begin an exercise regimen, see your doctor first. Please know this: when you begin, it will hurt. When I started to jog, it was quite a task for me. The first five minutes was painful. I pushed through the initial hurt. I began to experience the release of endorphins. These chemicals are released from the brain to reduce the feeling of pain and increase mood. I started to experience a euphoria described as a 'runner's high'. Source: WebMD The body is well-equipped to deal with pain. Don't let it stop you from becoming a better you. I faced the painful truth that I was no longer 'curvy' or 'thick'. I was fat. lol This enabled me to think clear-headed about my choices. I was able to go to the doctor and get a health assessment. I read books on nutrition. I stopped buying junk food. I am eating better and exercising. It all began with the truth, exercising and eating right, and getting through the pain of it all. There is a good feeling on the other side. I feel great after a workout or run. I understand that the initial discomfort will dissipate and on the other end is a feeling of satisfaction. I have not reached my goal weight, yet. When I look in the mirror now, what I see is progress. That is enough to keep me going.